The human-made “technosphere,” all the manufactured goods around today, surpasses the natural biosphere in mass and variety, geologist Jan Zalasiewicz of the University of Leicester in England and colleagues report online November 28 in The Anthropocene Review. Books alone, at about 130 million titles, surpass the estimated 8.7 million eukaryotic species on Earth. The technosphere is one measure of how humankind is reshaping the planet (SN: 10/15/16, p. 14), the researchers note. TOPLINE SUMMARY FIGURE: 506 million metric tons is the approximate combined mass of all living humans. 30,000,000 million metric tons is the estimated mass of the technosphere. It's amazing how many people think you should have the right to kill yourself, but no right to borrow money at high rates of interest. (4/9) U.S. Representative Justin Amash is a long time friend, has been an incredible role model to me, and happens to be one of the most transparent and principled members of Congress. It’s a huge source of pride that he represents the area I was raised in, West Michigan. As the son of Middle Eastern immigrants and also a Republican, he has strong thoughts on President Trump’s Executive Order calling for a travel “ban” or “pause” on those coming from Middle East. Also on the topic of immigration, the Planet Money podcast looks at three economists proposals on their ideal immigration system. (5/9) Three interesting maps and/or data visualizations that have recently caught my eye. First, via Bloomberg, mapping the world’s most innovative economies. From Forbes and Statista, ranking and comparing doctoral degrees by nation. And from the Pew Foundation, survey results on the public’s perspective of workforce automation and how they expect said automation to affect their career. (6/9) A few links on the pitfalls and social problems being caused by big data analytics. ProPublica recent hosted a great event on the topic that I recommend watching. Some of the data privacy issues discussed remind me of a great piece by Kashmir Hill: “How Target Figured Out A Teen Girl Was Pregnant Before Her Father Did.” From 2012 but still a great read. Also, I suggest looking into Cathy O’Neil’s “Weapons of Math Destruction,” which is nicely sumerized in an Econtalk conversation between O’Neil and Russ Roberts. (7/9) Two outstanding and timely podcasts that take a critical look at international trade policy based on two of the economics discipline’s strongest and most rigorous academic critics. Russ Roberts interviews George Borjas on Econtalk. And Freakonomics interviews David Autor. Both podcasts do a deep dive into the most rigorous criticisms of open trade while also balancing the discussion with nuance on the positive effects. Strong critics and strong supports of open free trade should walk away from both podcasts less sure of their priors. 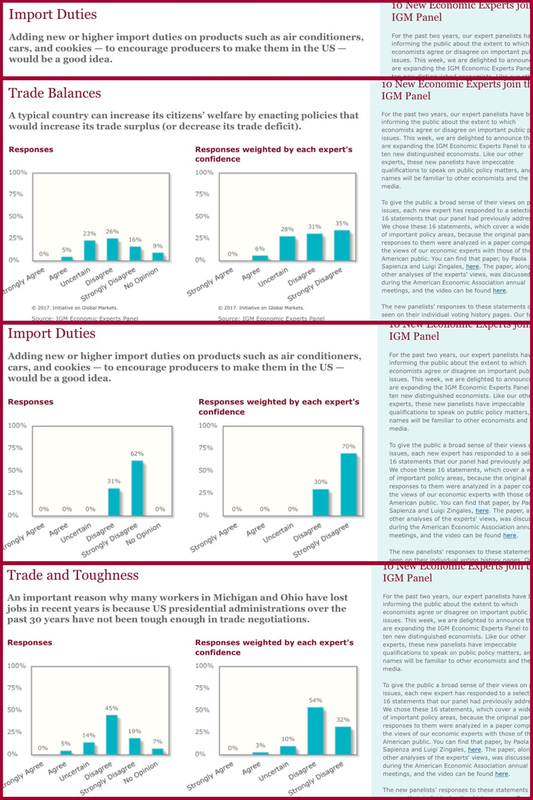 The University of Chicago Booth School’s IGM economists panel have surveyed on the question of trade a number of times and have found strong support for an open, free market trade policy. Link to the three surveys here, here, and here. The Mercatus Center has a great recent piece discussing the case for trade and debunking key myths. Also on trade and with respect to recent policy debates inside the beltway, Scott Lincicome digs into the “destination-based cash flow tax,” or as it trended on Twitter, the #DBCFT. Great deep dive into the measure. Also, from Lincicome in National Review this past April, a great overview of the case for trade which addresses the work of Autor and Borjas. (8/9) A few recent links on autonomous vehicles and the innovative automotive start-up space generally. In Forbes, a look forward at the movement and advancement in the underlying tech. Bloomberg looks at the current VC involvement in the space. And from a VC firm, the a16z podcast of Andreessen Horowitz looks at the prospects for autonomus cars and how the technology might affect cities. (9/9) Staying on the topic of start-ups and venture capitol, some links of interest on “unicorns” (private start-up firms with a valuation exceeding $1 billion) and the initial public offering market. The Wall Street Journal and Venture Beat have early looks at the prospects for the 2017 IPO market—see the WSJ chart below on IPO prices. Also, interesting article from the NYTimes on all of the preparation and due diligence SnapChat underwent in preperation for IPO. 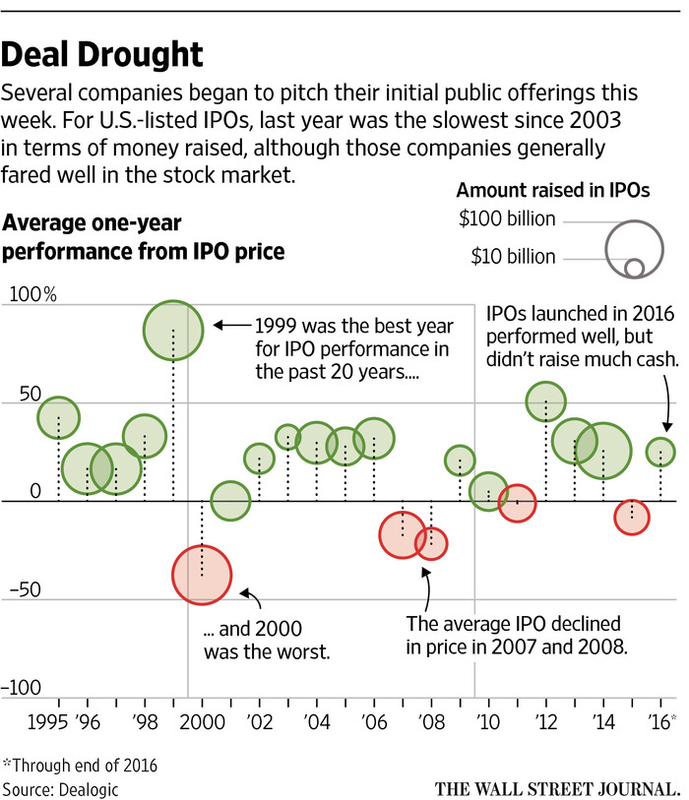 Towards a more robust start-up space and IPO performance, public policy reform is absolutely low hanging fruit. My good friend William Rinehart at the American Action Forum has written on what an innovation agenda in public policy would look like. Also, take a look at the a16z podcast and Lincoln Insitute panel discussion, both embedded below.